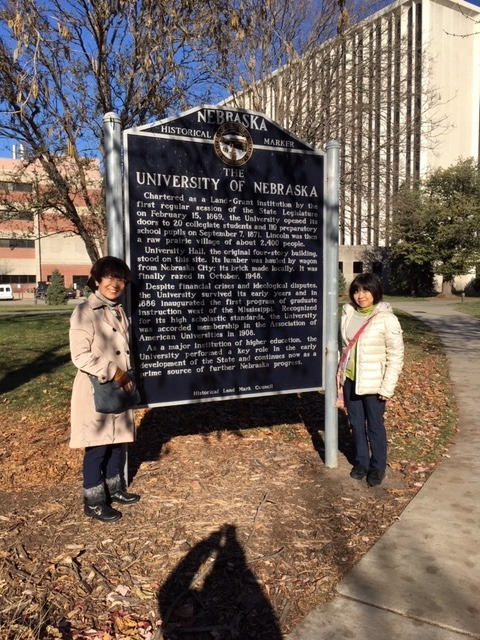 Posted on Sunday, January 21st, 2018 at 2:39 pm. 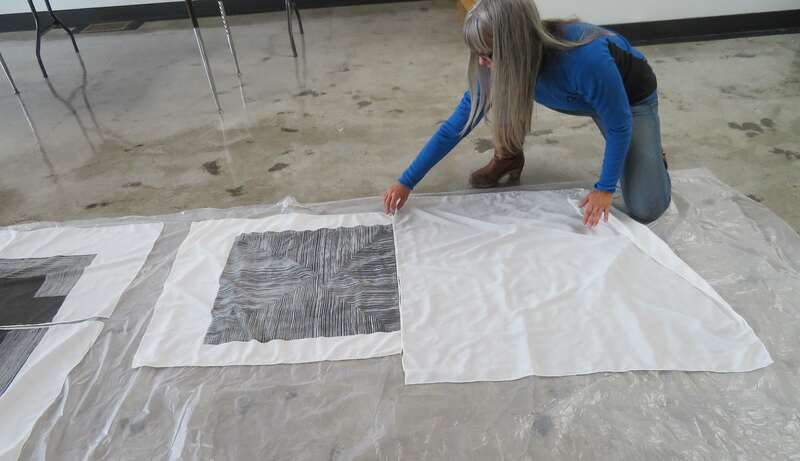 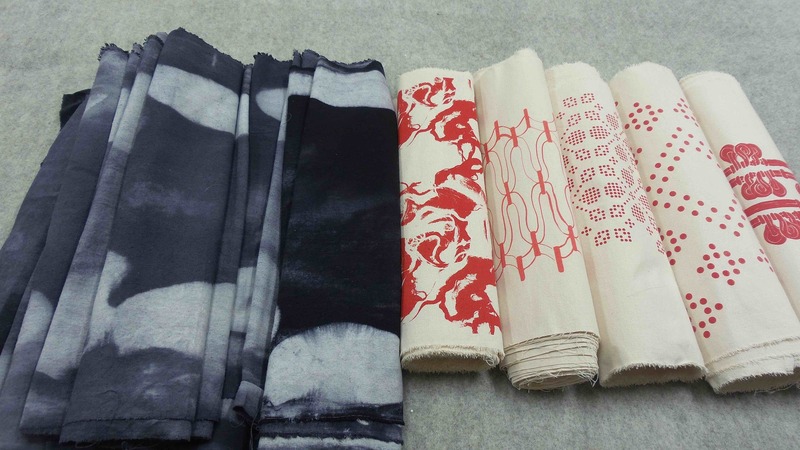 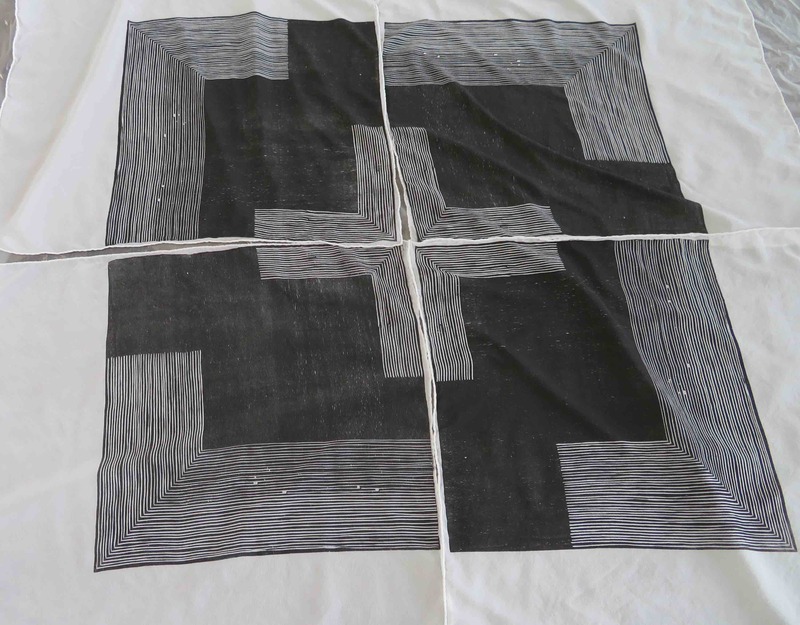 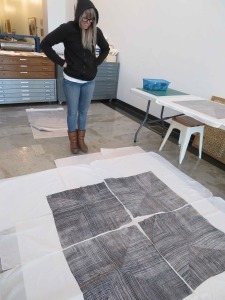 Jenene Nagy spent an intense week of carving thin lines onto woodblocks and printing onto silk fabric with silver and graphite oil base inks to create a collection of “flags”. 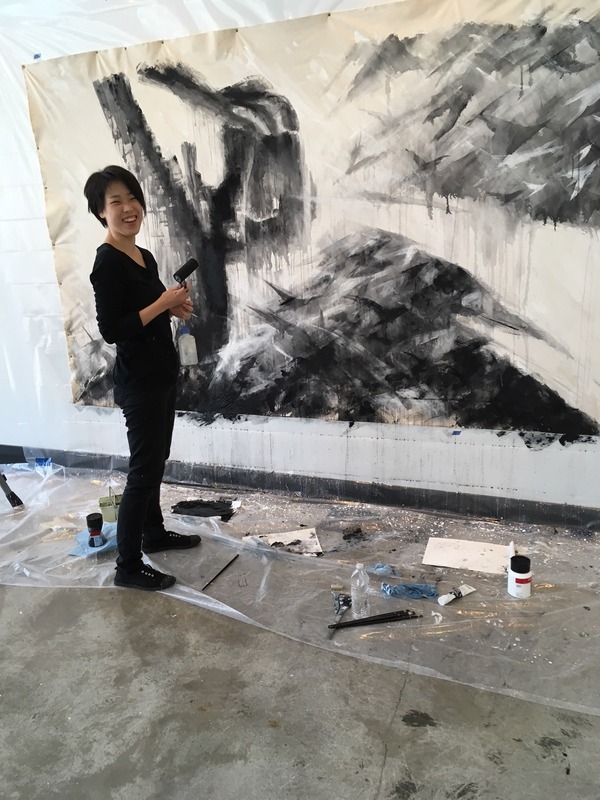 Her work plays with the formation of signs from the negative and positive shapes and repetitions, as the flags are grouped to create optical new interior spaces and contrasting “afterimages”. 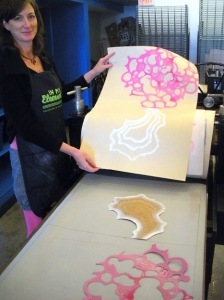 She is interested in how “the flat graphic print becomes activated in space through the physicality of its material”. 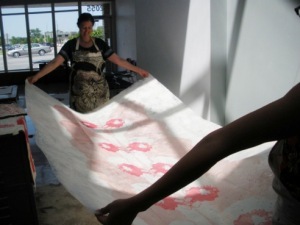 We experienced this visual versatility through the floating of the silks……beautifully flowing as we carefully handled and printed the sensuous fabrics and while looking through and within each. 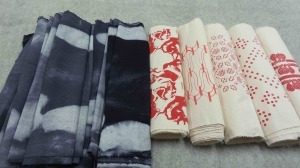 Jenene will use these printed flags for an upcoming installation/sculptural project to be presented in New York this spring. 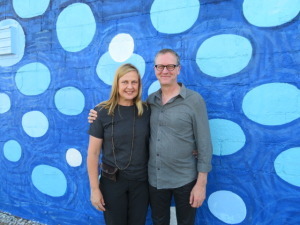 We are so proud to have been instrumental in this important production! 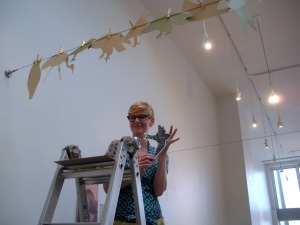 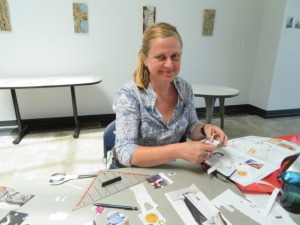 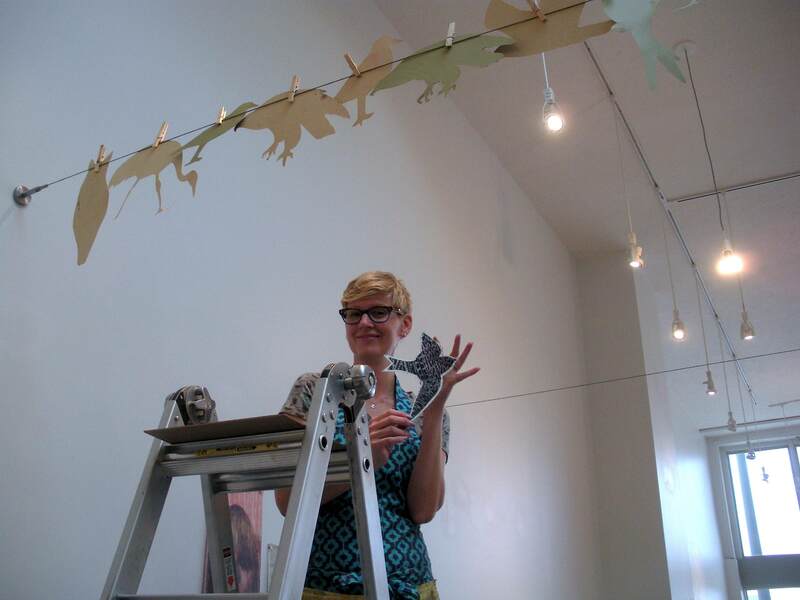 Jenene Nagy is a teacher and curator who lives in the Los Angeles area. 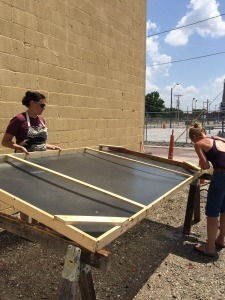 Posted on Monday, July 31st, 2017 at 5:59 pm. Marnix & Veronique came from Ghent, Belgium for a two week residency at Constellation Studios. 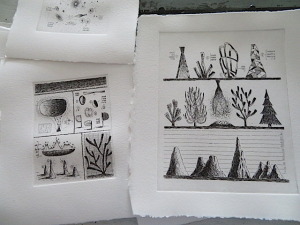 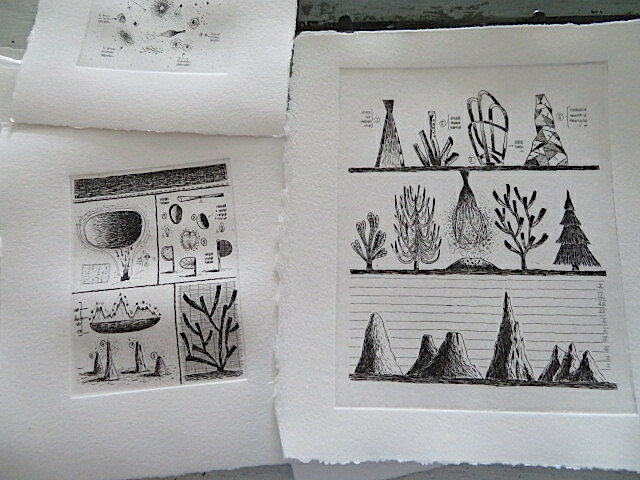 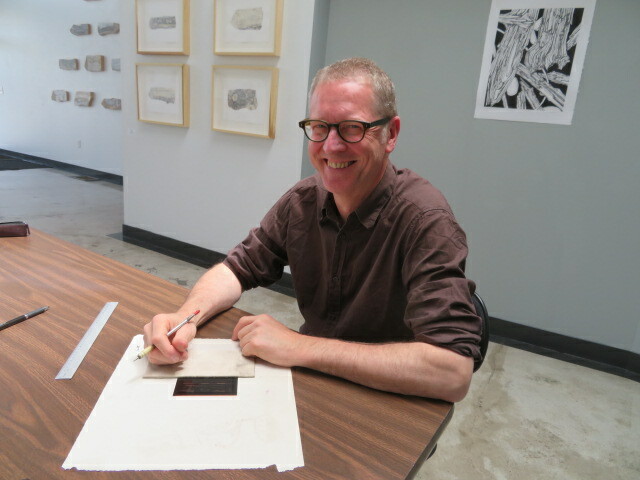 Marnix developed his copperplate etchings with non-toxic BIG ground and acrylic aquatint for a new print series that suggests science-like instructions and images. 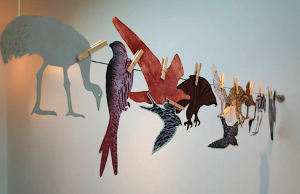 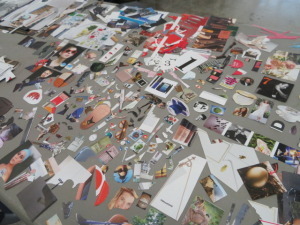 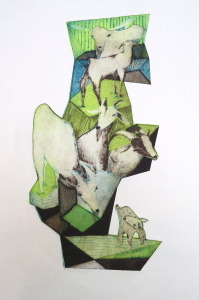 While Veronique developed her own cut paper image sources from design magazines to create meticulous and humorous collages. They enjoyed summertime and fireworks in Lincoln, and their time for a creative retreat. 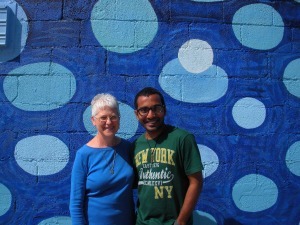 So great to have you here and look for your return soon so we can continue our conversations! 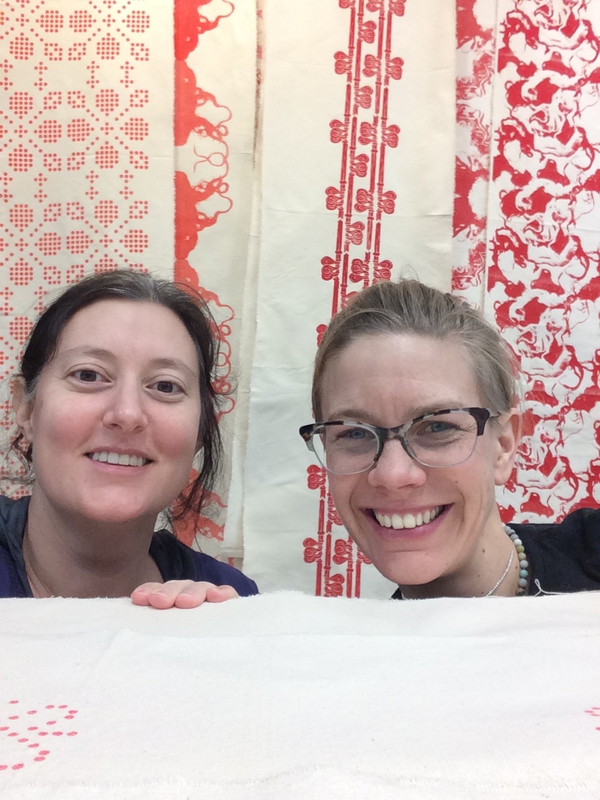 Posted on Tuesday, December 13th, 2016 at 8:32 pm. 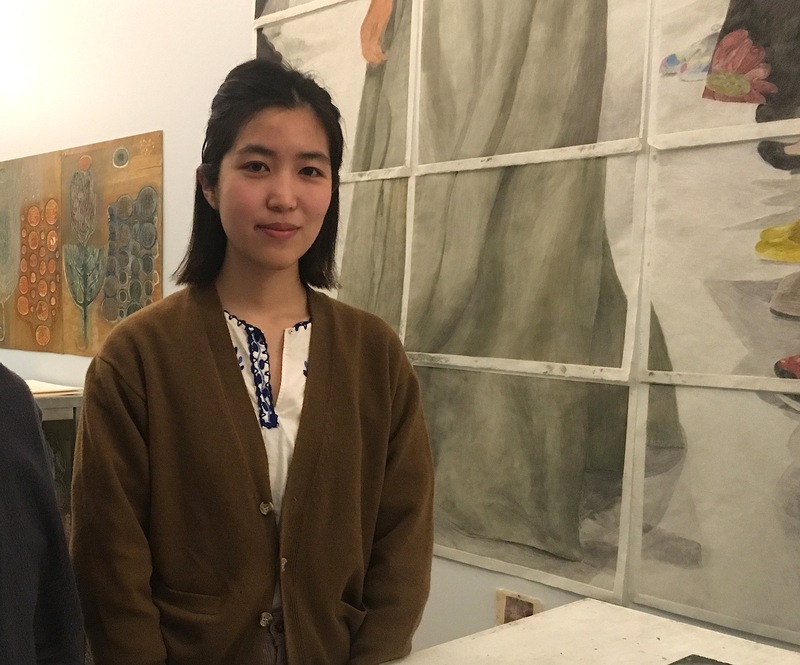 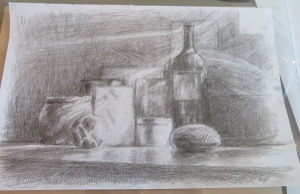 Shiho, from Tokyo, Japan, spent the month of November at Constellation Studios, and worked well in the rhythm of life in Lincoln, and with her own creative discipline. 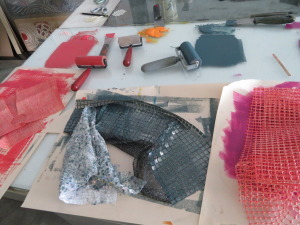 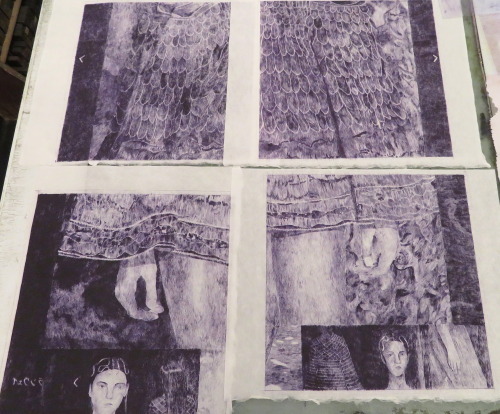 She planned and accomplished a large multi-sheet monoprint that addresses the subtleties of luxury fabrics and the fashion world. 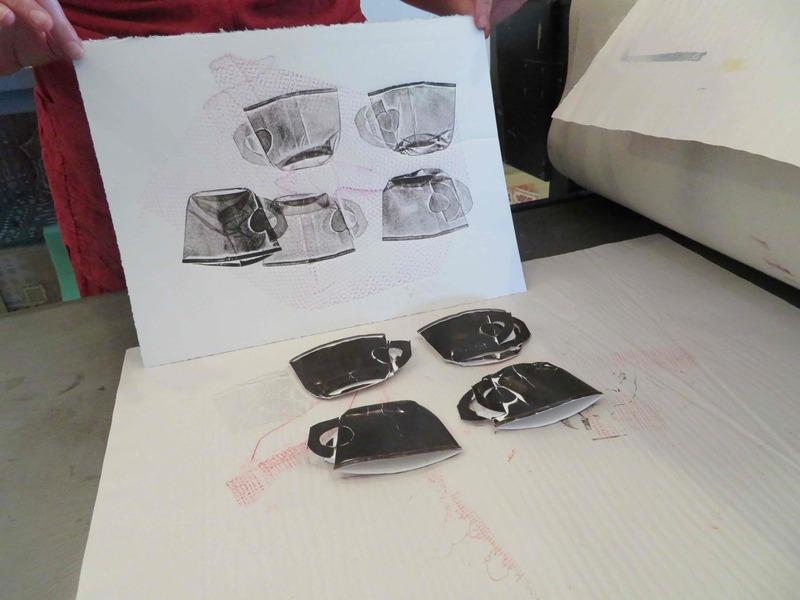 She also experimented with drypoint prints made from thousands of minute scratches on plastic plates, that she printed with water-base inks. 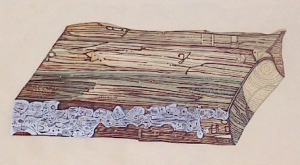 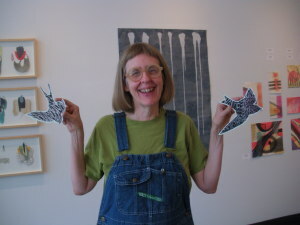 This technique, new for her, enabled her to make a small series of journal-like images from her experiences in Nebraska, and then a complex 4 part detailed image of a model on the runway and the audience. 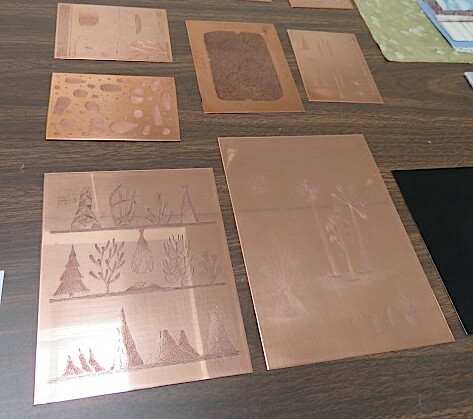 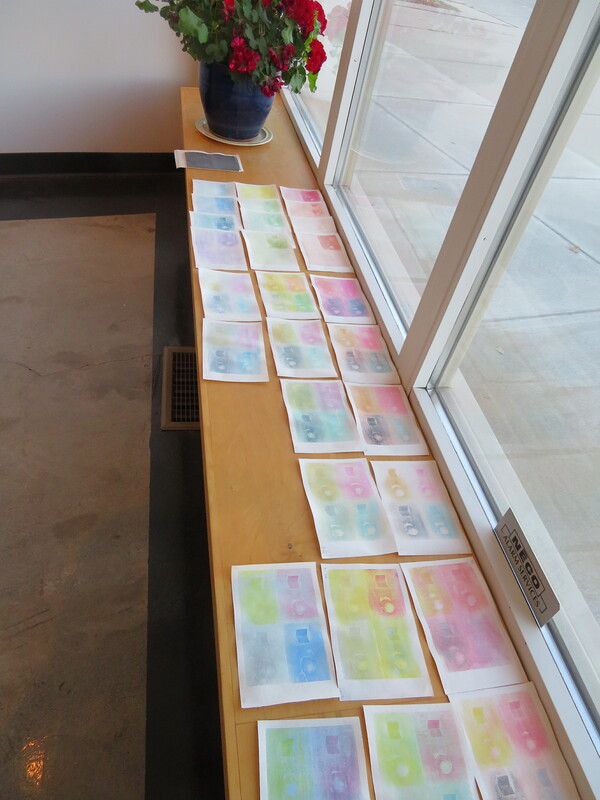 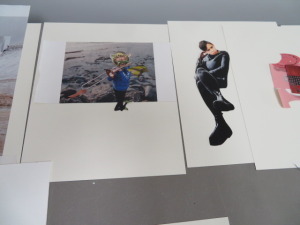 Shiho demonstrated incredible persistence and patience to realize her print projects! 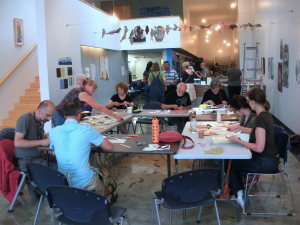 All so impressive for our First Friday visitors. 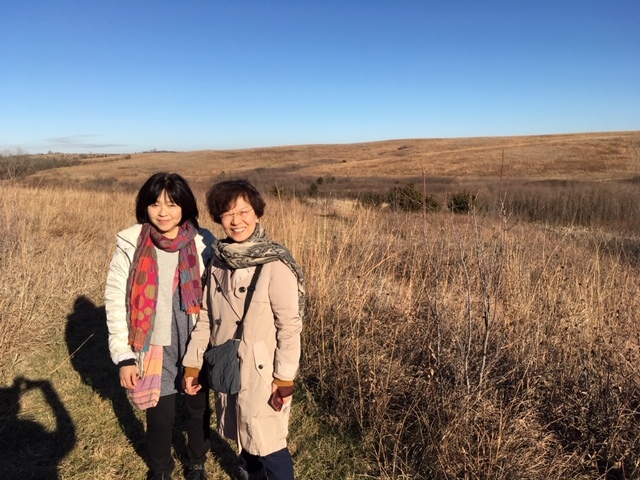 Thanks for your residency Shiho! Posted on Friday, December 2nd, 2016 at 6:00 pm. 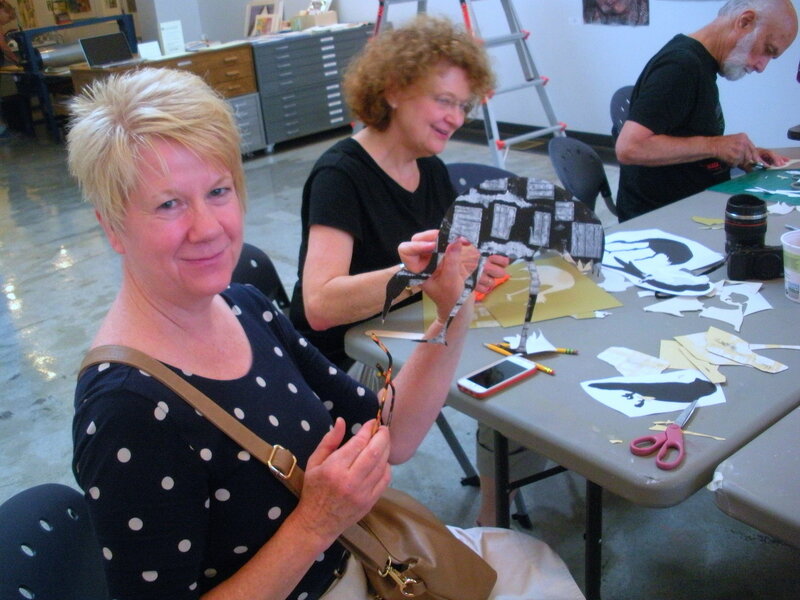 Join us for an in depth viewing of Metropolis & Invisible Cities. 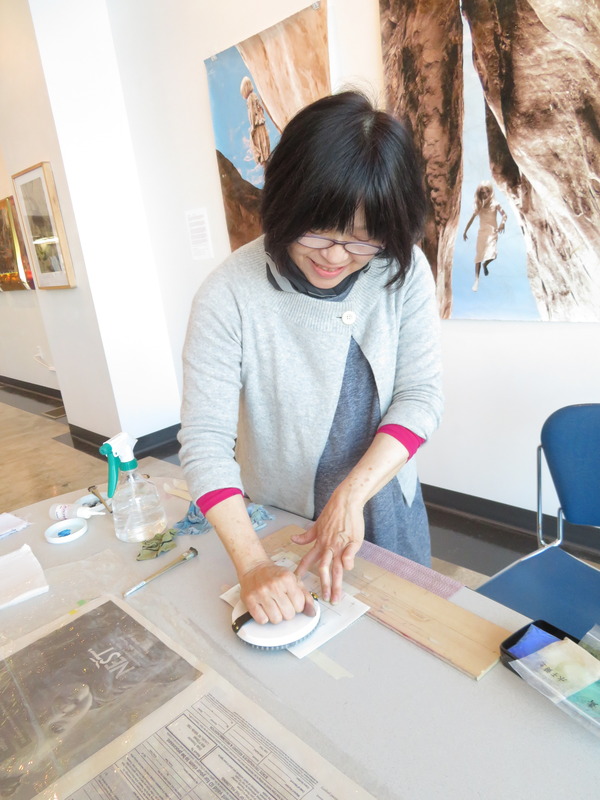 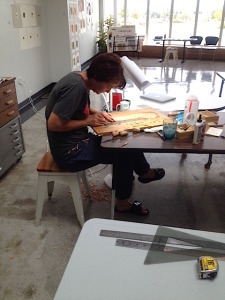 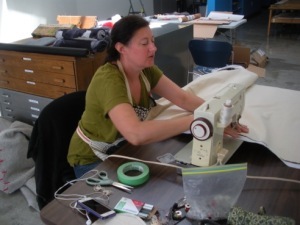 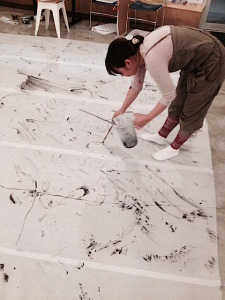 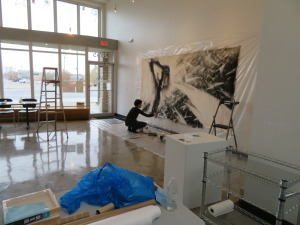 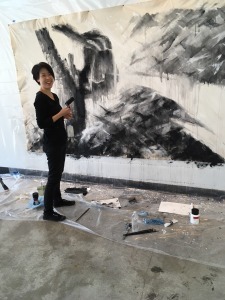 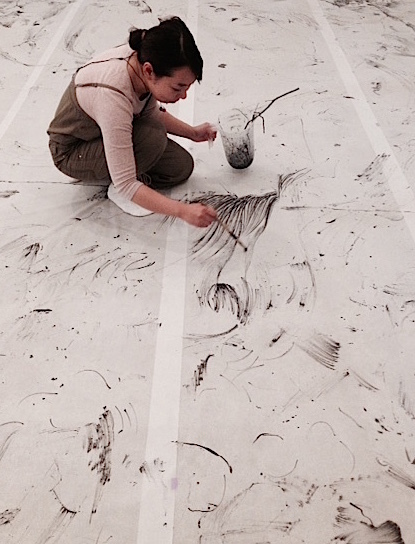 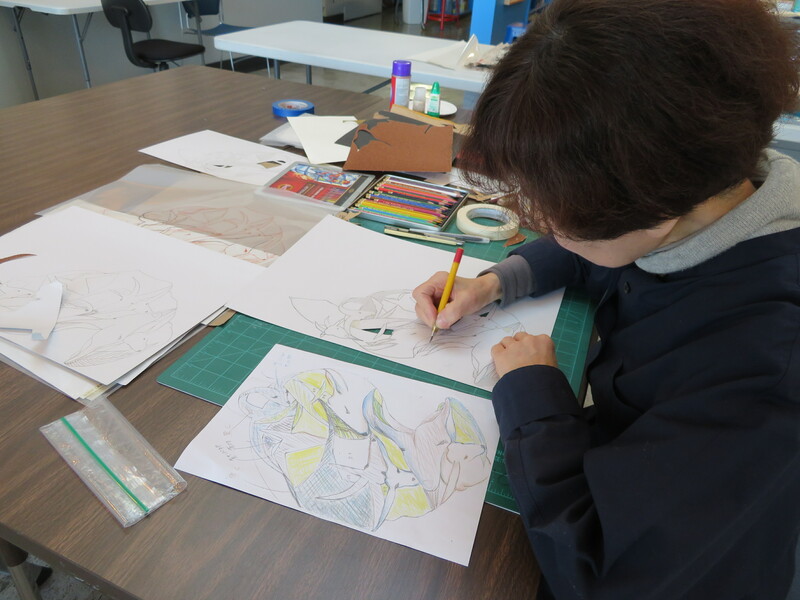 Meet Artist in Residence Shiho Saito, from Tokyo, Japan. 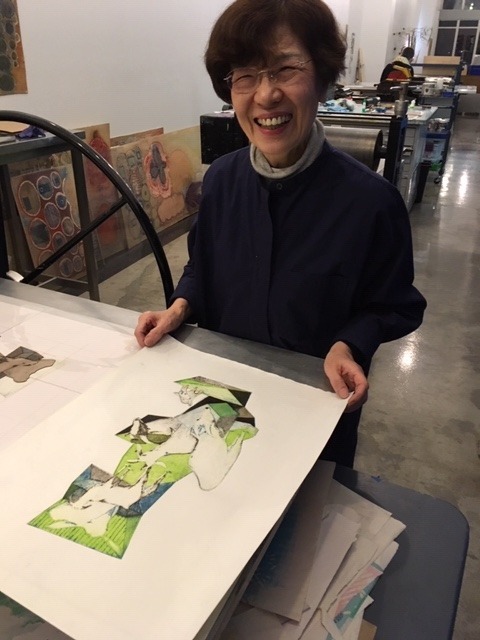 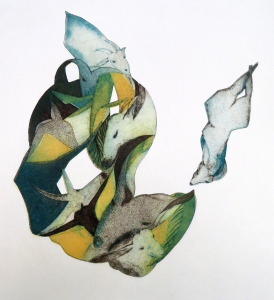 She has been in residence for a month creating monoprints and drypoint prints on Japanese papers, that reflect on fashion and elegance with spare and delicate marks. Posted on Friday, June 24th, 2016 at 6:00 pm. 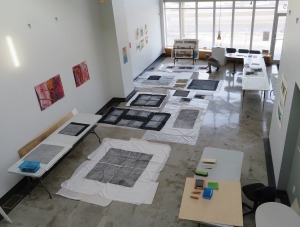 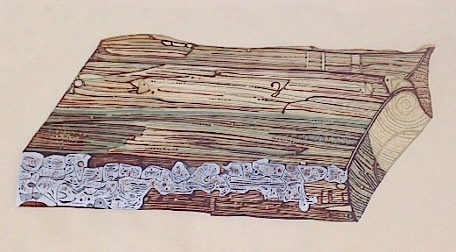 Lining: Sheathing is an exhibition experience that explores texture, handwork and embellishment inspired by the human urge to house the body and decorate environments. 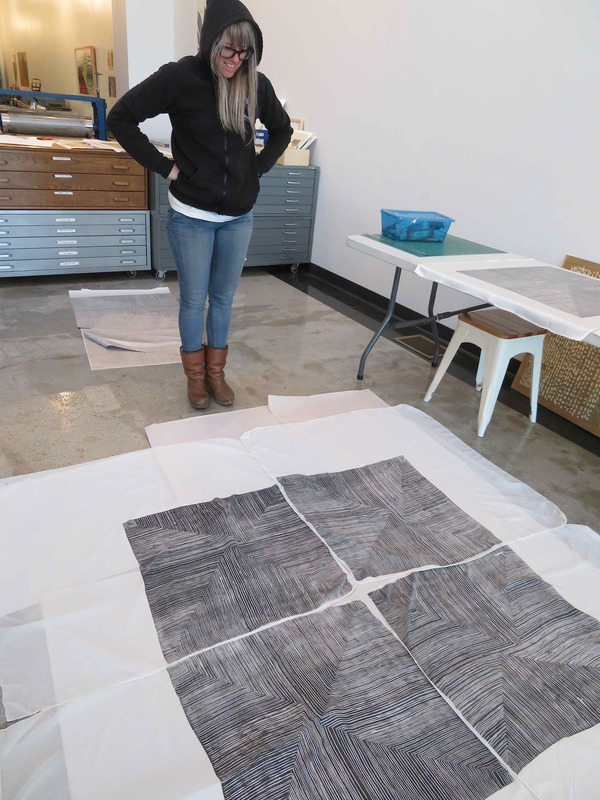 This installation concept presents volumes of materials that have been printed with textile content and historical designs, covering an enclosure space built for viewers to enter while enveloped in special wrappings for an immersive experience. 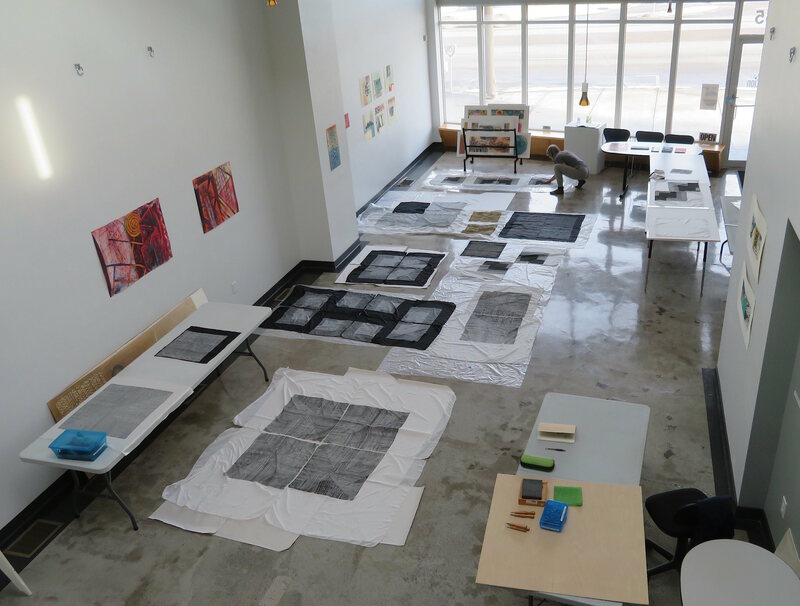 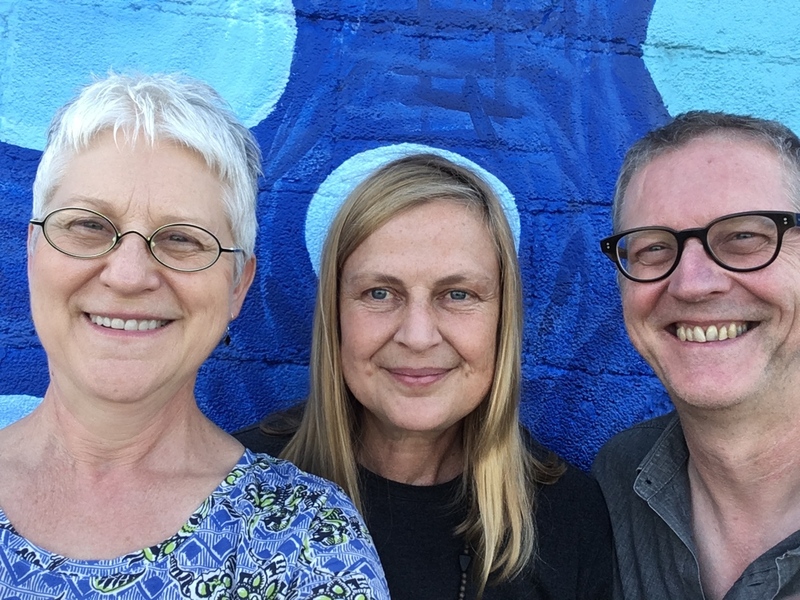 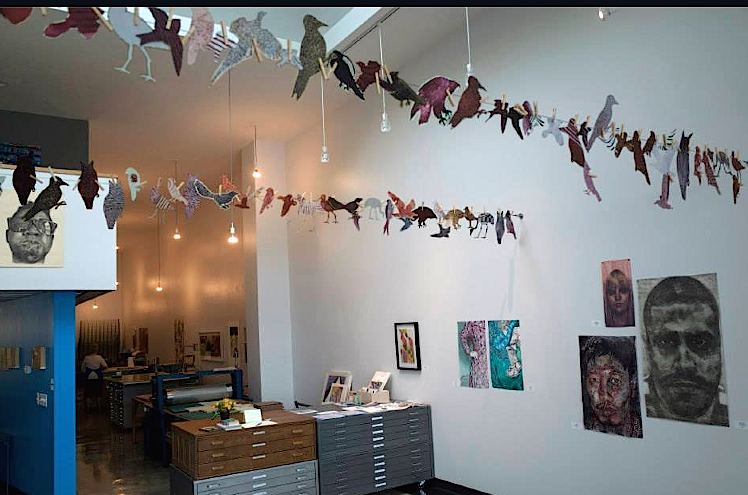 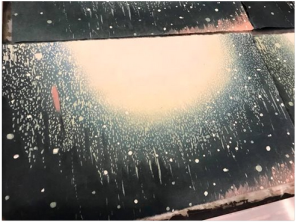 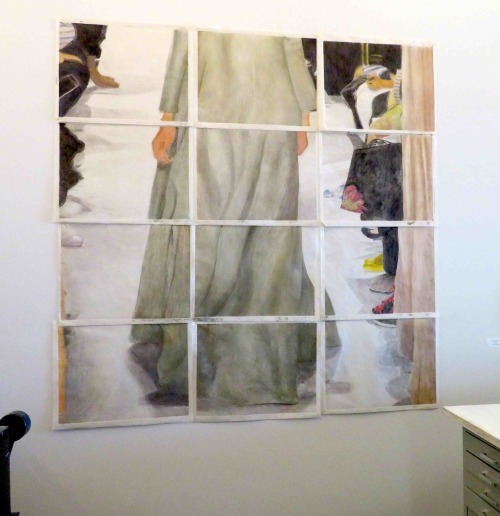 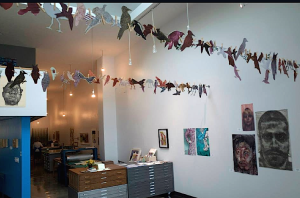 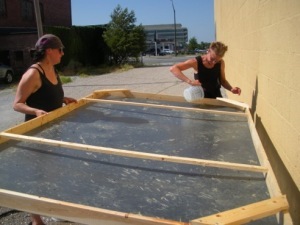 Artists Denise Bookwalter and Lee Emma Running have collaborated for a year on this multi-faceted concept, which culminates with their residency at Constellation Studios to realize this elaborate and ambitious project. Mass Migrations Print Action Shots! 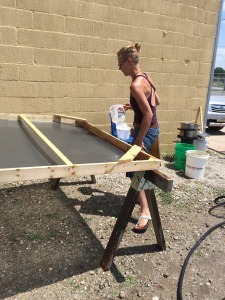 Posted on Sunday, August 2nd, 2015 at 1:22 pm. 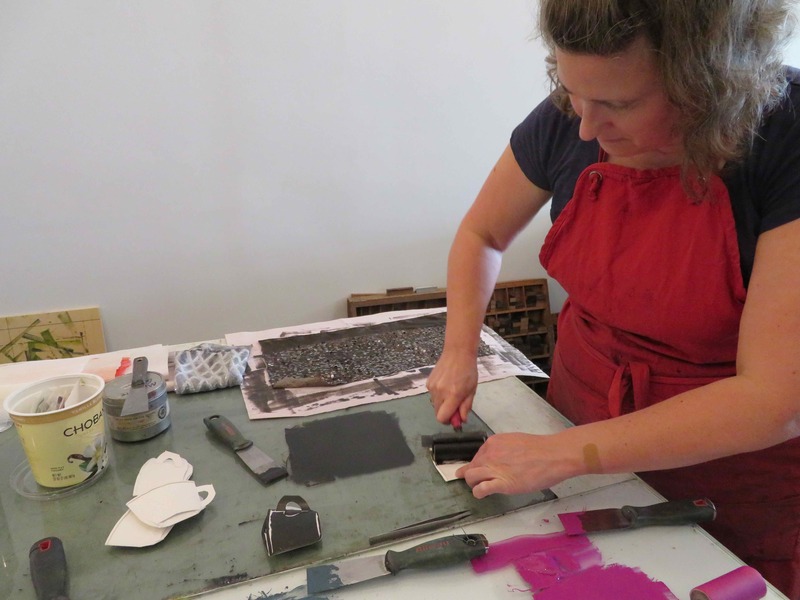 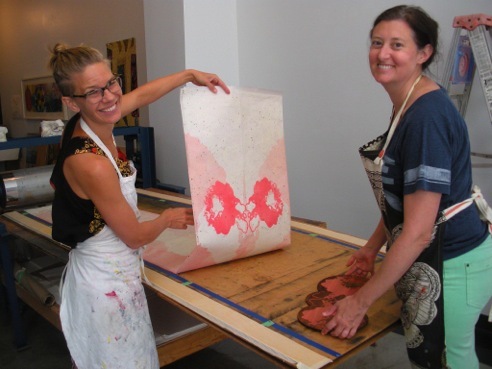 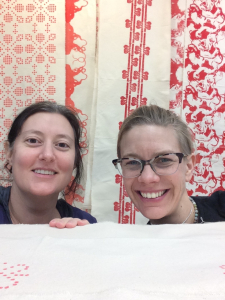 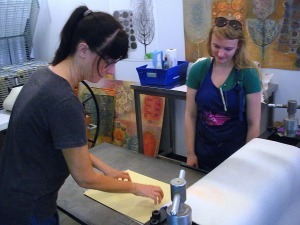 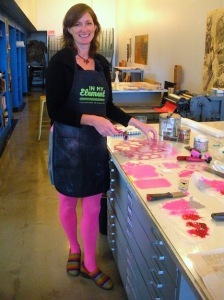 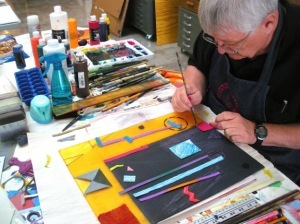 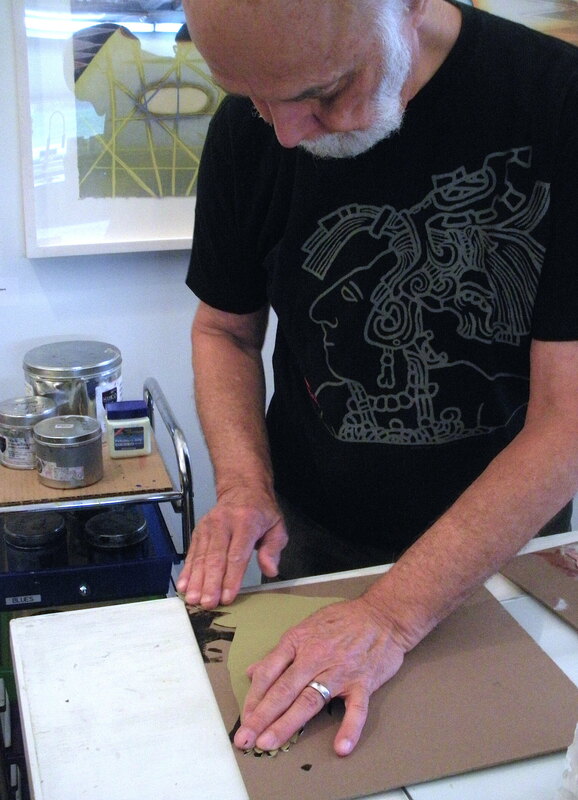 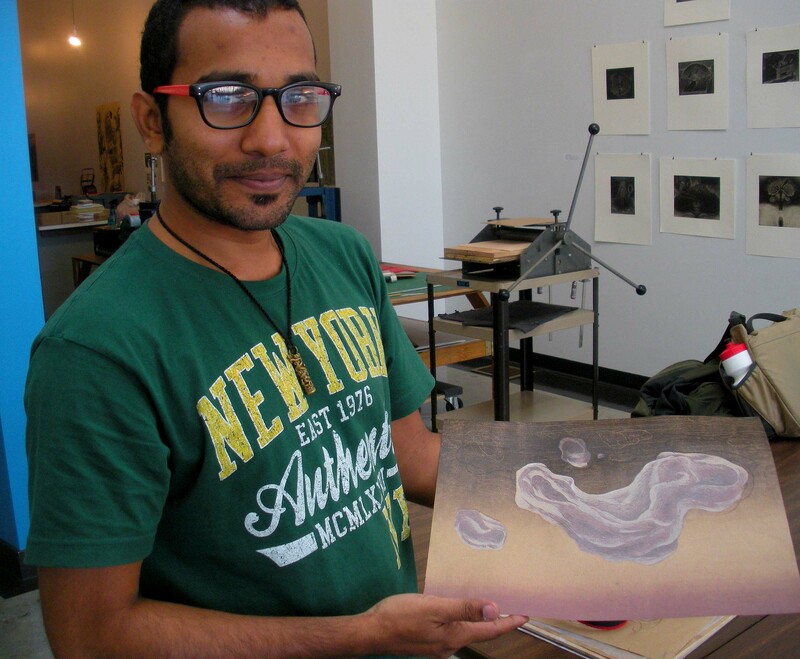 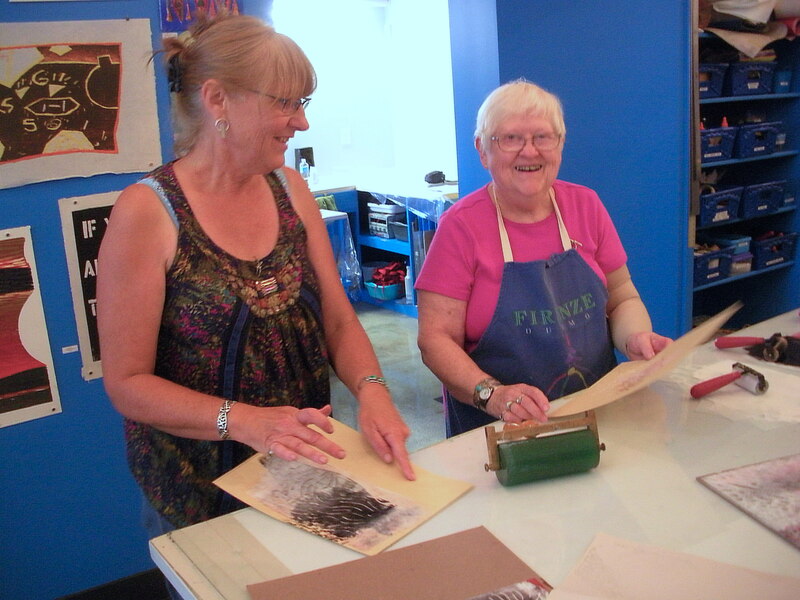 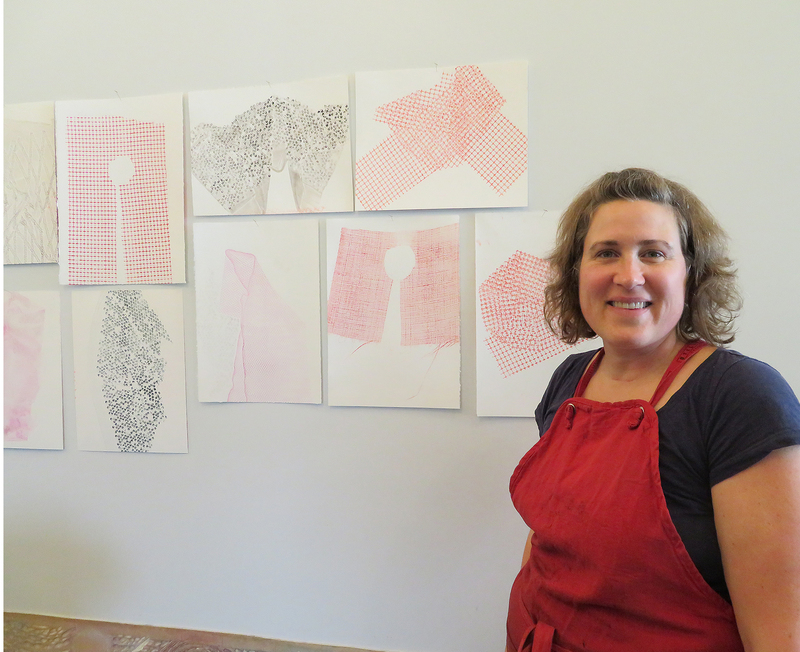 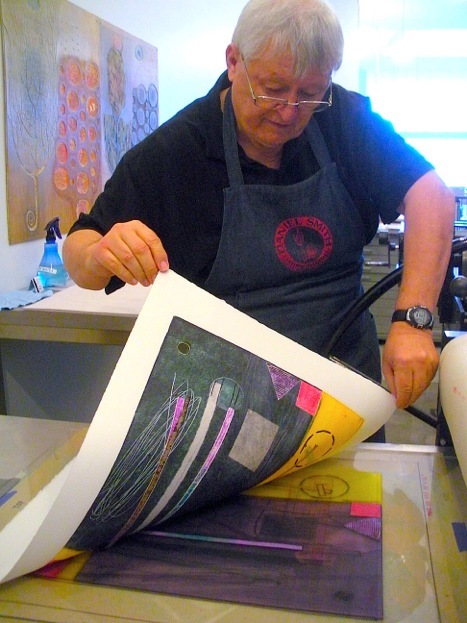 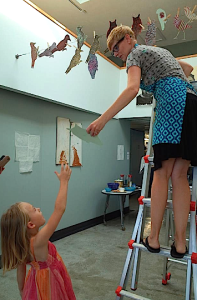 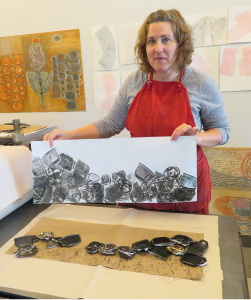 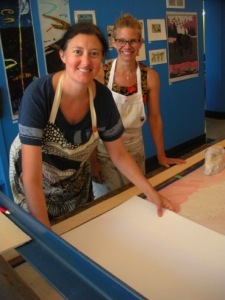 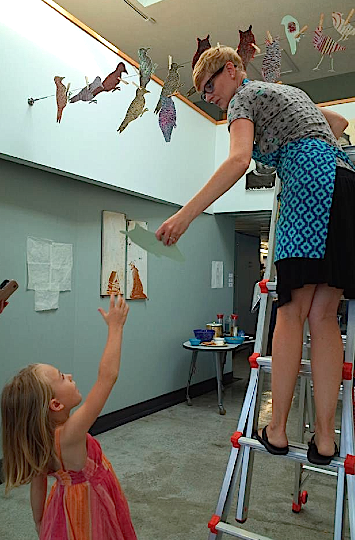 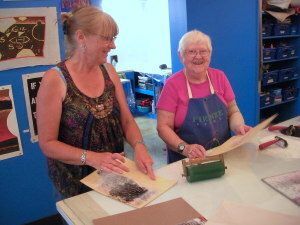 And here are some great photos of artists, friends, family, some new to printmaking! 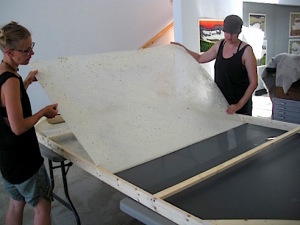 We will enjoy the installation through the end of August. 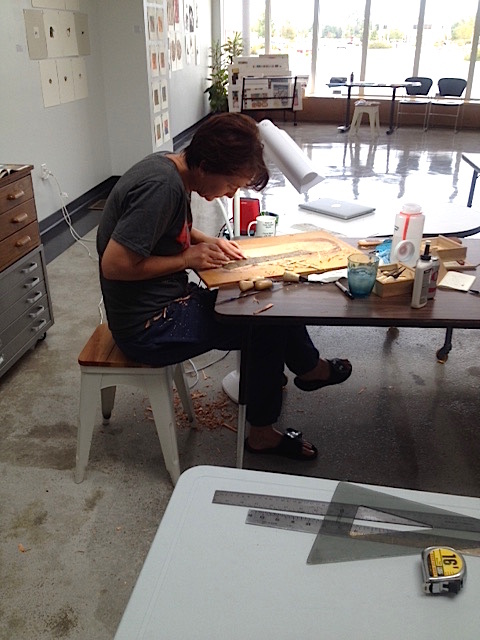 Thanks Rachel for a great residency and engagement with everyone at Constellation Studios!